Neil E. Reid was born in Bruce Township, of Macomb County, Michigan, on April 24, 1871. Both his paternal and maternal ancestors came from Scotland and settled in Macomb County. In the rural schools of Bruce Township, Reid mastered the elementary branches of learning and afterward attended high school in Almont and in Romeo. A scholarship gave him the benefit of a year’s attendance at Harvard University. Taking up the study of shorthand, he became the court stenographer in Mount Clemens in July of 1894. While in law school, he worked for three dollars a week as a law clerk. He graduated from the Detroit College of Law with an LL.B. degree in 1896. Governor Fred W. Warner appointed Reid judge of the Probate Court, over which he presided for 13 years. He had a reputation for being a tough judge, especially with cases regardng prohibition violators and armed robbers. Reid won his seat on the Michigan Supreme Court by defeating incumbent Bert Chandler. His campaign was deemed a “postcard” campaign in that he sent all his friends postcards requesting their votes. Reid credited his “many friends” for the victory. He began his service on the Court in 1944. Reid was described as a six foot four, gaunt, yet colorful man. 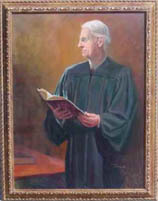 Neil E. Reid died of a heart attack on May 4, 1956, while still employed by the Court.